10 Best Android Apps: Smartphone users do not know how many applications they use in their phones. Smartphone users install applications on their smartphones according to their usage, but some applications are useful for all users, we should know about such applications so that we can easily do our work. In today's article, we will learn about the 10 Best Android Apps that are of great use. The best part of all these applications is that you can download all of these apps for free and use it, then let's know about the late 10 Best Android Apps. This application is very useful. If you want to use your time correctly, then this application must be on your smartphone. With this application, you can create to-do lists, voice lists, notes, reminders, etc. The interface of this application is very great and the best part is that you will not see any kind of ad in it. Let's look at its features. This application is one of the lists of my best applications. This application is very useful. With this application, you can design a social media post, poster, photo collage, logo, card etc. Its interface is very good and in this application, you will not be able to see any kind of advertisement. It's very easy to design graphic in this app, you get many more templates which you can download and download accordingly. Let's look at its features. If you have a passion to listen to the song and when you listen to songs before sleeping then this application can prove to be very useful. This application closes the songs according to the time you set so that the songs do not run in the mobile overnight, as well as the battery discharges your smartphone. This application works perfectly on all platforms such as Play Music, YouTube, Spotify etc. Use your favorite music player or even YouTube! This application has been told in the last several articles. You will not find this application on the Play Store, with this application you can download videos, Songs from 1000+ websites. This application is quite popular for downloading YouTube videos. It is available for both Android users and computer users. Let's look at this feature. This application is also Google's application. This application is very useful for those who want to get information related to their bank account or to do online transactions. With this application, you can transfer money to anyone's bank account, pay the online bill etc. The best part of this application is that with the help of this application, you can do transactions with the front person without giving your private details. This application is specially made for Indians. Let's take a look at the features of this application. Every smartphone user wants to have a better wallpaper in his smartphone, you can see many wallpaper applications on the Play Store, but the best wallpaper application is the one that is one of them. Million to see a lot of wallpaper in this wallpaper application, from this app you can download and use the wallpaper for free. If you are looking for the best wallpaper app then this application must be tried. If you want to customize your smartphone in many ways then this launcher must be on your smartphone. This launcher is the most popular launcher in the Play Store, perhaps you already know about this application. This application is available in the free version and Pro version. With this application help, you customize the layout of the smartphone, the icons of the app, the animation, etc. 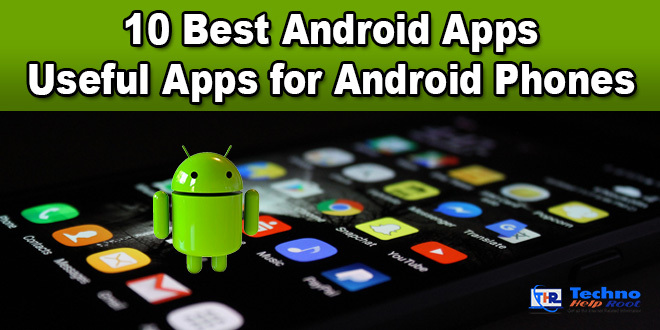 We know about 10 Best Android Apps in this article, I hope all these applications will prove to be very helpful for you. If you liked this article, please share it with your friends on social media.